Successfully Added Notebook Tool Bag - Classic to your Shopping Cart. Complete tool set containing 17 indispensable accessories for your PC. This all in one tool bag comes with a multitude of useful computer tools. Supplying everything you need for troubleshooting, testing, and system maintenance, you don't need to be a tech geek to wonder how you survived without it. 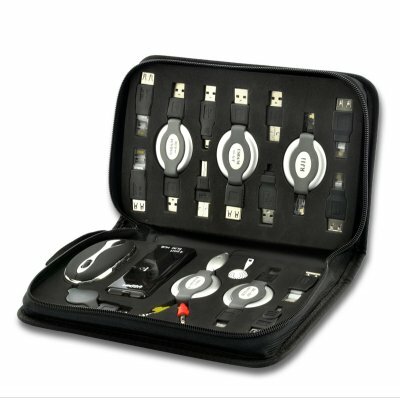 Amongst the tools you’ll get are an optical USB mouse, a 4 port USB hub, earphones and various USB cables serving different purposes. On top of that, all cables come with an ingenious retractable system so the wires never tangle. All of this comes is a premium carrying bag with rigid polyfoam which is custom made to fit all the tools. All 5 star fast shipping and good packing. all items a in the set are working. quality stuff. on 2009-05-09 18:32:18 Excellent Product for Computer techie !!! Really this is very good product for Computer hardware and software people ! !